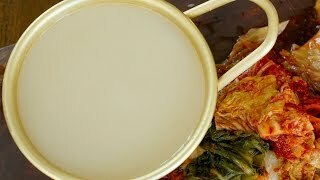 Today I’m going to show you how to make makgeolli, a traditional Korean alcoholic beverage made by combining rice, yeast, and water with a starter culture called nuruk. It’s milky-white, fizzy and refreshing. It’s also called “nongju” which means “farmer liquor” because it’s made with a lot of rice, it’s full of carbohydrates and was traditionally served to farmers as part of a midmorning snack or with lunch, giving them the strength and energy to work the rest of the day. Korea has a long history of homebrewing, and every family used to make their own booze at home, it was much more common than buying it. These days you can buy makgeolli easily at a Korean grocery store or liquor store but when it comes to taste, it can’t be compared to homemade makgeolli. Homemade makgeolli is thicker, less sweet, and more filling than store sold makgeolli. This recipe is also in my cookbook, Real Korean Cooking, and while developing the recipe I sent a sample of the finished product to the EMSL Analytical food lab for a full nutritional and toxic analysis to see what is really inside it. They let me know that it is totally safe to drink, 7.4% alcohol by volume, cholesterol-free, fat-free, and contains vitamin B1, B2, B3, B5, and B6. It’s high in calories and has a lactobacillus count of 375,500 CFU/mL. Lactobacillus is a kind of lactic acid bacteria that’s good for your stomach and digestion and can boost your immune system. It’s also found in yogurt, but in much higher quantities. So it’s great for giving you energy and is good for your stomach, but the real reason to drink it is it’s so refreshing and delicious! It’s also a great thing to have at a party, and especially when you make it yourself, your family and friends will love to drink it and have a great time doing it. Making good makgeolli is not very difficult, it just takes a little time and there are a few pitfalls to avoid. 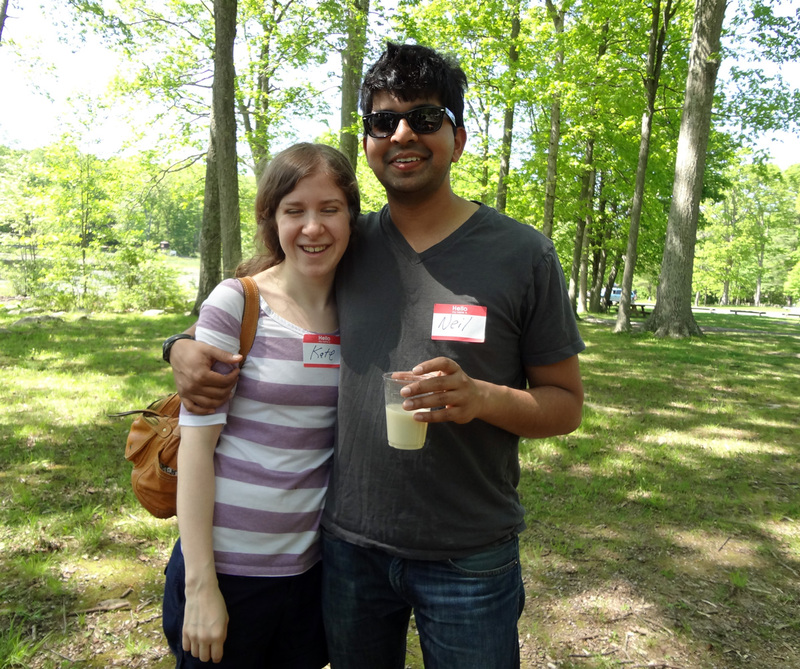 I’ve been making makgeolli for special family occasions and my reader meetups for years. Some of you who came to my meetups and tasted my makgeolli have been waiting years for this recipe. Thanks for your patience! Make some makgeolli and enjoy life! Let me know how it turns out! Drain the rice and put it into a heavy pot. Add 4 cups of water. Cover and cook over medium high heat for 15 minutes. Stir and turn the rice over with a wooden spoon. Cover and simmer it for another 15 minutes over low heat. Remove from the heat. 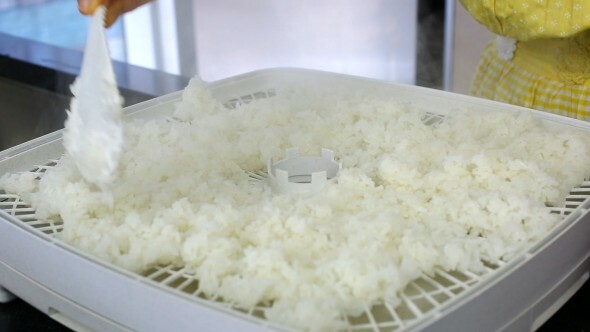 Transfer the rice to a basket of your electric dehydrator. Spread the rice evenly, and fill as many baskets as you need. Cover, set the temperature to 160° F, and dry for 3 hours, until the outside of each grain is hard, but the inside is still moist. If you don’t have an electric dehydrator, you can dry your rice for several hours in a shallow basket set in breezy, sunny place. Put the rice into the earthenware crock. 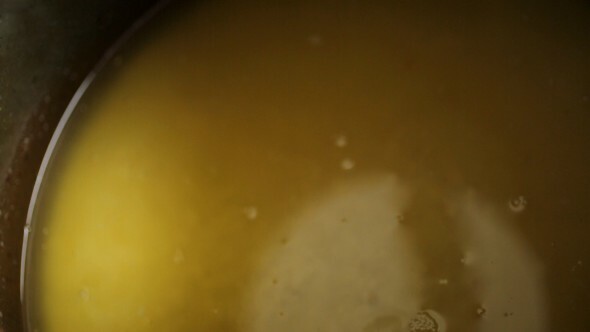 Add nuruk, yeast, and 8 cups of water and mix well with a wooden spoon. Place a cotton cloth under the lid when you close it, to let some air circulate in and out. Let sit for several hours, then uncover and mix well with a wooden spoon. 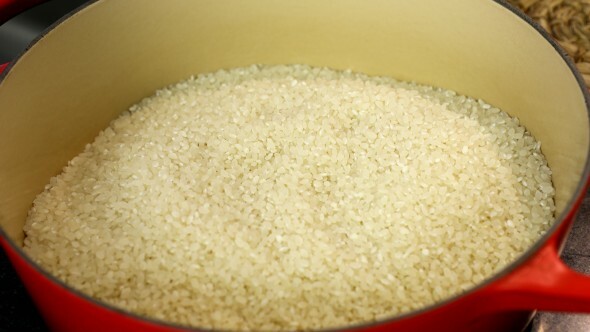 At this point, the rice will have absorbed a lot of the water to create a thick paste. Cover and let sit overnight. Open the crock and you’ll see a lot of bubbles popping to the surface, and the mixture will be a lot thinner than yesterday. Stir it well with a wooden spoon and cover again. Stir it a few times a day for the next few days. 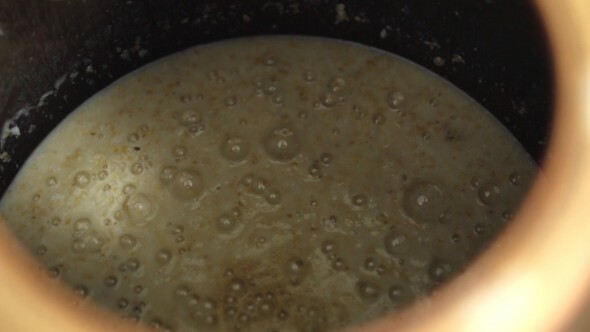 On day 4 or 5, it will be bubbling a lot less and will have separated to a clear liquid on top and a milky mixture on the bottom. Mix well, and keep mixing a few times a day for a few more days. On day 8 or 9, there will hardly be any bubbles at all. The liquid on the top will be clearer and more amber. It’s now perfectly fermented and ready to drink. 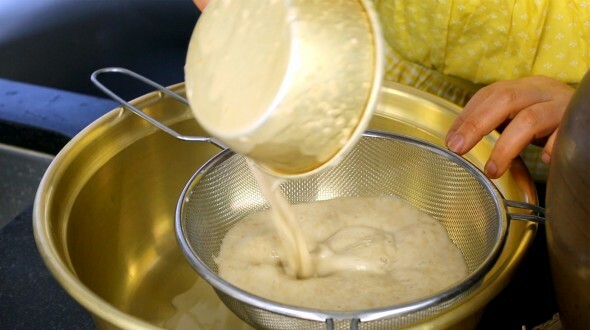 Strain the makgeolli into a large bowl, pressing on the solids with the back of a wooden spoon to squeeze as much liquid as possible out of it. Discard the solids. Add 8 cups of water to dilute. Add the optional sugar and mix well. 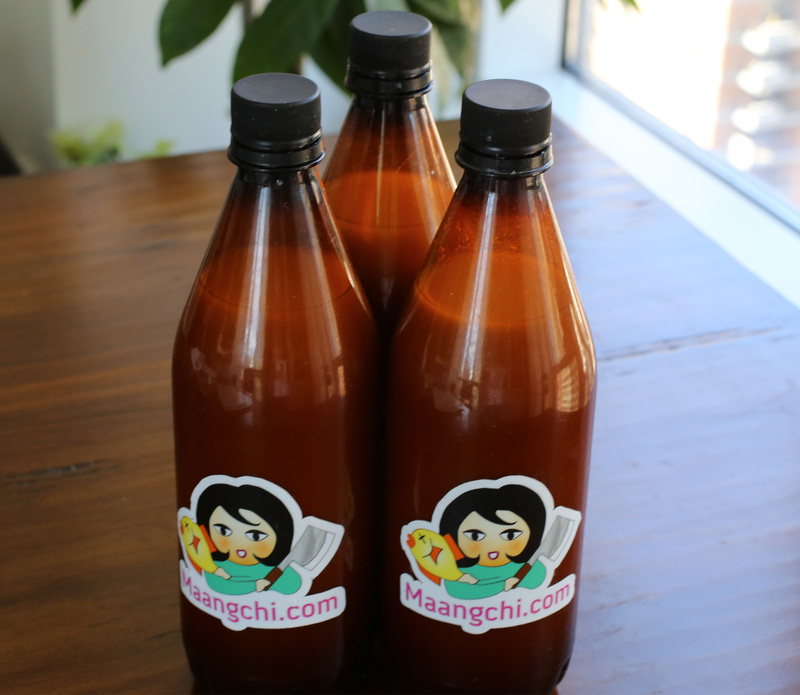 Strain the makgeolli one more time and put it into glass jars or BPA free plastic beer bottles. Serve cold, and stir or mix well before drinking. Serve with kimchi or some side dishes. It can keep in the fridge up to 2 to 3 weeks. Posted on Thursday, May 21st, 2015 at 10:51 am. Last updated on May 22, 2015. Posted December 29th, 2018 at 11:43 am | Log in to reply. I’ve tried making this and I taste them everytime I stir them. It tasted good on day 6 and it went sour the next day. I keep having same problems.. what do I do?? Posted November 21st, 2018 at 7:05 pm | Log in to reply. I’d like a recipe for Soju… Andong Soju. Show how to distill it, etc. I found something online, but then I’m not clear how to make it not turn into vinegar in those 3 weeks. Posted November 21st, 2018 at 8:28 am | Log in to reply. 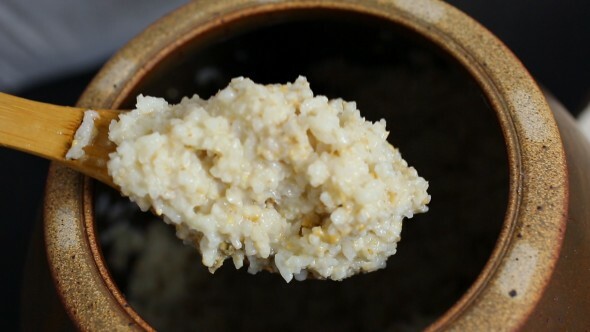 i am from india and i am doing a project on alcohol fermentation as my major.as a kdrama fan i want to try making maekgeolli but there is no nuruk to buy in india.so can i prepare maekgeolli without nuruk or can you make a video on how to make home made nuruk.it would be so helpfull if you would answer it. Posted November 21st, 2018 at 6:58 pm | Log in to reply. You can’t make it without Nuruk… but I’m also hoping she posts how to make Nuruk. Posted August 23rd, 2018 at 1:35 pm | Log in to reply. Posted August 1st, 2018 at 10:42 pm | Log in to reply. I’ve made Makgeolli a few different times and culture my own Nurak. I fine each recipe unique and thanks for sharing your recipe. Your recipe is the first time I’ve seen a dehydrator used, could you elaborate on why? I usually let the rice cool on the counter on my cheese cloth with a small fan for an hour or so to prevent killing the Nurak yeast. I’m also trying picking up different wheats to culture different flavor Nuraks for this winters brewing. I recently learned the method of making Danyanyju/Gwanaju where addition spirits are added. Posted August 13th, 2018 at 8:20 am | Log in to reply. Wow it sounds like you are an expert in making makgeolli! My recipe is made from my experience over the years. 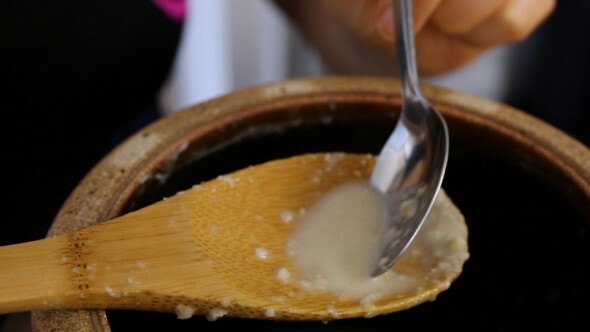 The traditional way to make makgeolli is with steamed rice, and then after steaming the rice you can cool it down like you did and make makgeolli with it. But in this recipe I was making makgeolli an easier way and instead of steaming, i made rice in a rice cooker, but I needed to dry it out. Without drying it out the alcohol level in the makgeolli is too low. Posted August 17th, 2018 at 1:26 pm | Log in to reply. I’m interested in how you culture your own Nuruk. Nuruk is impossible to get in this area of Tennessee and ordering it online is expensive. Posted July 2nd, 2018 at 5:59 pm | Log in to reply. Hey Maangchi, I ordered an 11 liter onngi and a dehydrator. I have my first batch of Makgeolli started. I am looking forward to drinking it from a Makgeolli pot and cups I bought for my dad while I was working in Korea. Posted July 1st, 2018 at 4:34 pm | Log in to reply. 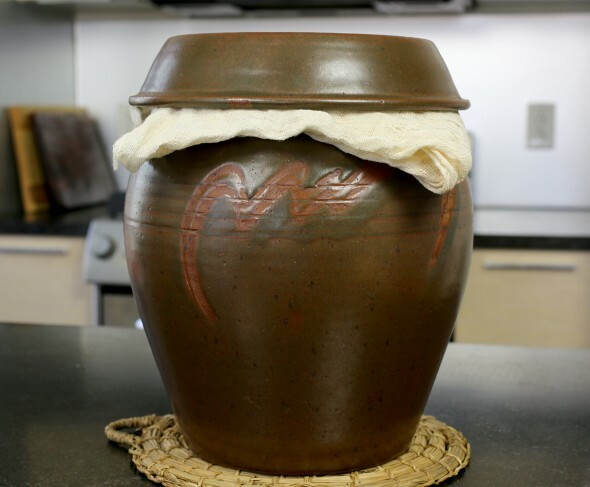 Question-Can you substitute a ceramic pot for the earthenware pot to ferment the Makgeolli ? Posted November 21st, 2018 at 7:01 pm | Log in to reply. You could, but Onggi are special in that they are made to breathe (as in the pot itself, not just the opening at the top. And Earthenware, in general are more Porous. It would be the same result as using say… a glass jar. Onggi, though, if you are a serious kimchi maker, want to make sauces, or Korean alcohol are a worthy investment. You can buy them online and sometimes from Korean markets. Posted April 23rd, 2018 at 6:26 am | Log in to reply. Hi Mangchi…is it necessary to soak the rice overnight. I have tried 2 batches with different kind of rice. The final color is different. 1 is more amber while the other is more white in color. Posted April 23rd, 2018 at 6:28 am | Log in to reply. Posted August 17th, 2018 at 1:27 pm | Log in to reply. How much of the yeast balls did you use? I have a really hard time getting nuruk where I live. Posted November 21st, 2018 at 7:03 pm | Log in to reply. Technically not Makgeolli… since nuruk has other things besides yeast in it. Posted February 23rd, 2018 at 8:51 am | Log in to reply. I am going to try making this soon. But is it possible to give me the ingredients in grams? Posted February 21st, 2018 at 12:52 pm | Log in to reply. If I wanted to brew this with fruit at what point would I add the fruit and how much fruit would I use? Posted November 21st, 2018 at 7:04 pm | Log in to reply. Third to fourth day I would say since the sugars will break down if you do it longer or at the end. Posted February 12th, 2018 at 10:53 pm | Log in to reply. Made my second batch of makgeolli. It tastes great and my friend took back 2 litres home to enjoy. :) Definitely tastes better than the commercialized ones. Posted November 22nd, 2017 at 9:23 am | Log in to reply. Hi Maangchi! I’ve just ordered a dehydrator and am going out in search of an onggi today! 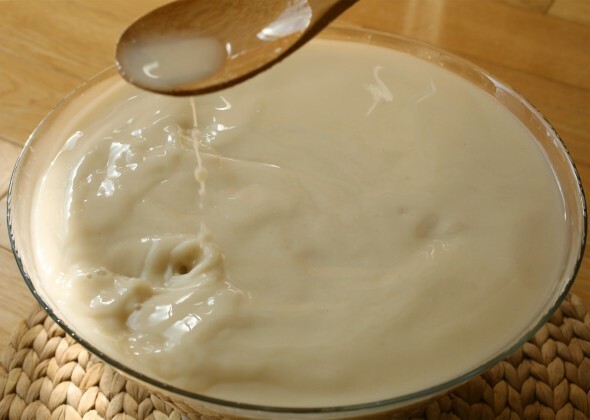 I have one question – store bought Makgeolli is sometimes flavored with things like chestnut or banana. Do you have any tips for flavoring the Makgeolli with additional ingredients? This recipe was originally posted on May 21, 2015 at 10:51 am by Maangchi. It was last updated on May 22, 2015. The video was watched 675,273 times on YouTube & has 13,121 likes!